Pro Quality Camera. Miniaturized. Connected. The DxO ONE provides exceptional performance by packing the most innovative components available into an ultra-compact and elegant design. Made from top-end materials such as aluminum, the DxO ONE features a built-in lens cover that slides open easily when you’re ready to shoot. With the camera’s Framing Assistant and two-stage shutter button, you can easily compose, lock focus and capture photos with just one hand. 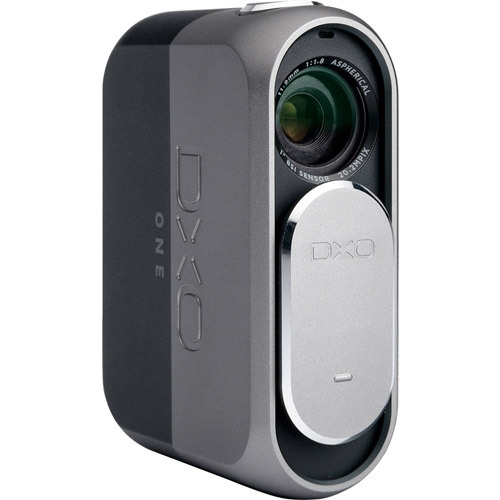 Weighing in at just 3.8 ounces and well under three inches tall, the DxO ONE is incredibly small compared to other high-end camera models. You can easily slide it into your pocket or clutch purse. 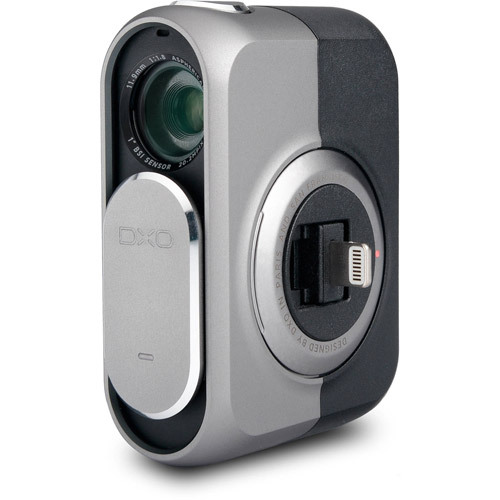 Regardless of the situation, the DxO ONE can go with you anywhere, anytime. Compact and lightweight, the DxO ONE can go everywhere with you. Autonomous, it comes with its own battery and a microSD port. You can use its OLED touchscreen to compose and capture the most beautiful moments with a simple gesture. With a max aperture of f/1.8, the DxO ONE’s 32 mm equivalent lens is perfect for natural portraits and exceptional landscape photography. The camera’s 1 inch sensor and 20.2 megapixels capture every last detail, providing you with stunning photos even in extreme low-light. To reduce the camera’s size, the space between the optical subassembly and the sensor must be as small as possible. Leveraging our expertise in the smartphone industry (over 300 million phones use DxO technologies), we’ve placed the lens of the DxO ONE in direct contact with the sensor, no gap, no air between them. 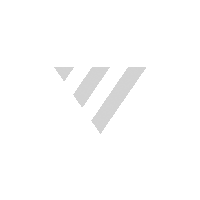 Image quality depends on the materials used in the lens design. DxO engineers chose a lens with six aespherical elements, offering an exceptionally high level of precision while also optimizing acutance. 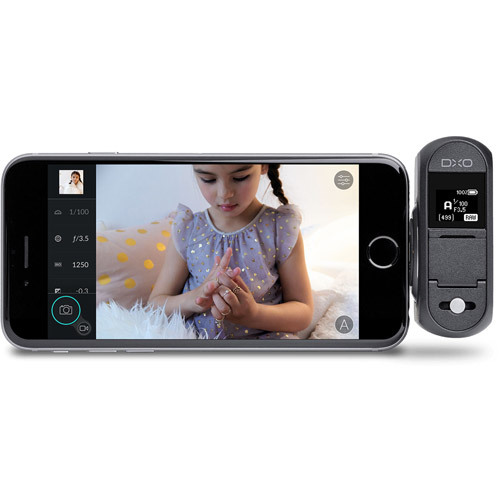 Built around a one-inch, 20.2-megapixel BSI-CMOS sensor with a body that’s three times smaller than other compact cameras with the same size sensor, the DxO ONE packs a lot of technology into a very small package. Enjoy detailed photos that are virtually noise-free, even when shot in low-light conditions. You can also turn your images into high-resolution large-format prints. Capture every vivid detail and take breathtaking portraits with the DxO ONE’s high-quality six-element aespherical lens. With a focal length of 11.9 mm (32 mm full-frame equivalent), the DxO ONE includes a six-blade iris diaphragm that lets you adjust the aperture from f/1.8 to f/11. This feature gives you precise control over depth of field and lets you create beautiful blurred backgrounds (bokeh effects). The Mobile Smart Lighting feature automatically improves your photos’ dynamic range, with an effect similar to having added a fill light. The DNG format is fully compatible with Abobe Lightroom and most other software programs on the market. Four photos are automatically captured in quick succession, then combined into a single RAW file. This method of image capture, when combined with advanced image-processing technology (spatial and temporal noise reduction), creates noise-free images that retain every subtle detail and preserve the colors. Plug the DxO ONE into a Mac or PC to preview, import, and process your RAW and SuperRAW files using DxO Connect, the DxO ONE’s companion program. Get the most out of your images with the click of a button, thanks to powerful DxO image-processing technology. Mac users can easily process their DxO ONE’s RAW, SuperRAW, and JPEG images with OS X El Capitan, thanks to a dedicated extension pack. Discerning photographers who want complete control over all conversion parameters for RAW and SuperRAW files will want to enhance their photos using DxO OpticsPro (software sold separately and available for Mac and PC). Create your own photographic style with DxO FilmPack, which accurately reproduces the finish and grain of analog films. Enjoy over 120 different styles, including 40 exceptional black and white analog film stocks—everything you need to give free rein to your creativity (software sold separately and available for Mac and PC). The files captured by your DxO ONE are compatible with other popular editing programs, such as Adobe Lightroom and Apple Photos. 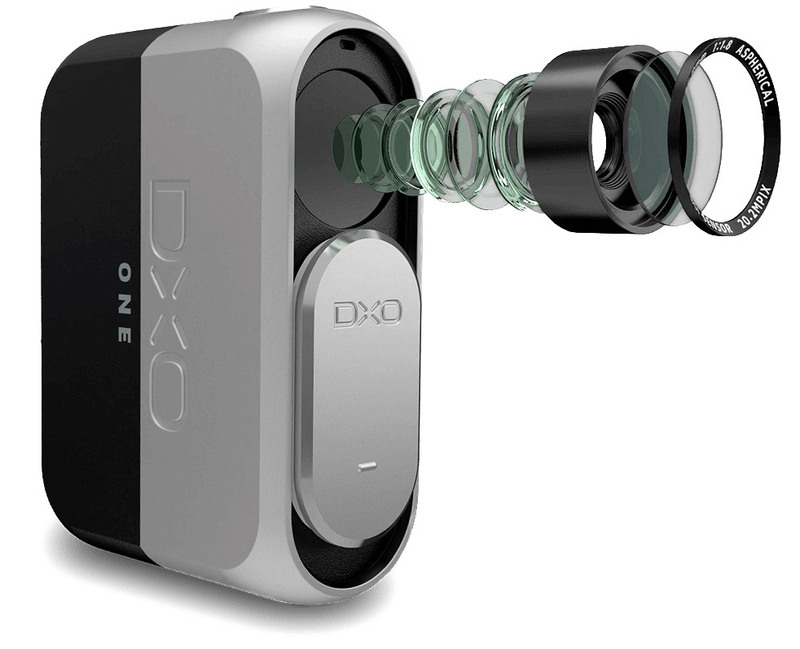 The DxO ONE includes a patented Lightning connector that springs open with the lens cover as its mechanism. This revolutionary design allows the camera to attach firmly and securely to the iPhone with a click. If the connector experiences undue strain, a safety mechanism separates the connector from the iPhone without damage. The patented Lightning connector and integrated safety mechanism are fully Apple-approved. The connector features a rotating base that also pivots +/– 60 degrees, giving you incredible range of movement to capture creative photos from any angle. 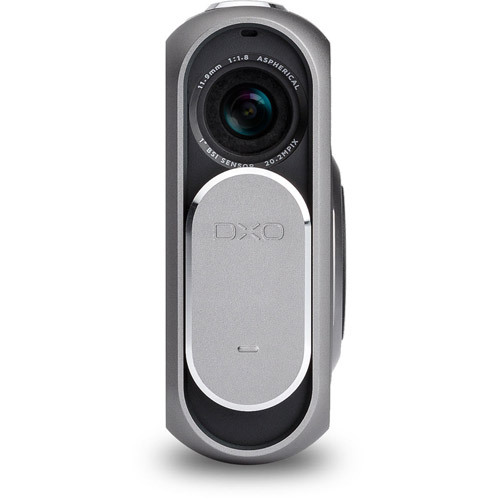 Hold the DxO ONE high above your head to film a concert in the middle of a crowd or place it low to the ground to record your child’s first steps. No matter the situation, you’ll find exactly the right angle to frame your subject.